Use Elastic Bandages to wrap body parts to reduce swelling. Bandages provide firm support compression to injured areas. They are ideal to hold first aid dressings or cold packs in place against the body. These bandages are comfortable to wear for extended periods of time. They are easy to use and adjustable to provide a custom fit. This bandage is 2" wide and has a metal tab to clip the bandage in place. Dimensions: 1.75" x 2" x 1.75"
Use Elastic Bandages to wrap body parts to reduce swelling. Bandages provide firm support compression to injured areas. They are ideal to hold first aid dressings or cold packs in place against the body. These bandages are comfortable to wear for extended periods of time. They are easy to use and adjustable to provide a custom fit. This bandage is 3" wide and has a metal tab to clip the bandage in place. Dimensions: 1.75" x 3" x 1.75"
Use Elastic Bandages to wrap body parts to reduce swelling. 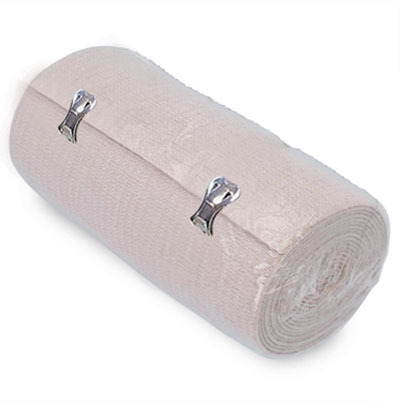 Bandages provide firm support compression to injured areas. They are ideal to hold first aid dressings or cold packs in place against the body. These bandages are comfortable to wear for extended periods of time. They are easy to use and adjustable to provide a custom fit. This bandage is 4" wide and has a metal tab to clip the bandage in place. Dimensions: 1.75" x 4" x 1.75"
Use Elastic Bandages to wrap body parts to reduce swelling. Bandages provide firm support compression to injured areas. They are ideal to hold first aid dressings or cold packs in place against the body. These bandages are comfortable to wear for extended periods of time. They are easy to use and adjustable to provide a custom fit. This bandage is 6" wide and has a metal tab to clip the bandage in place. Dimensions: 1.75" x 6" x 1.75"